Funeral Services for Alice H. Fries, age 100, will be 11 AM Friday, January 25, 2019, at Spear Mulqueeny Funeral Home, 667 Mentor Avenue, Painesville, Ohio. Family and friends will be received 4:00 – 7:00 PM Thursday January 24th at the funeral home. Interment will be in Perry Cemetery. Mrs. Fries was born July 8, 1918 in Toledo, Ohio. She passed away January 20, 2019 in Kirtland. 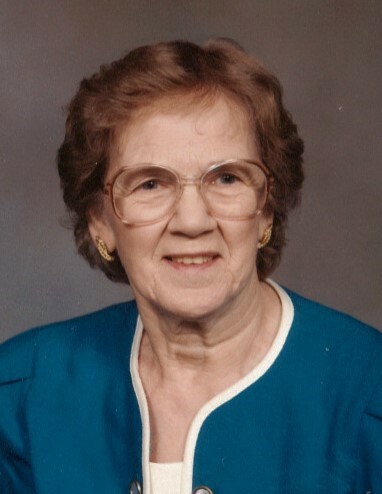 Alice was a 40-year Painesville resident and a member of New Day Christian Church. She was employed as a secretary for Blakely Insurance for many years. She enjoyed reading, bowling, dancing and traveling. Alice is survived by her daughters, Janet (Robert) Vladyka of Painesville, Carla Martin of Mentor and Sharon Fries of Mentor; grandchildren, Bonnie (Dave) Fisher, Deborah Dottore and Michael Gray,; great grandchildren , Stephanie (Steve) Billhardt, Heather Gray (Tyler Wilkinson) and Jared Gray; great-great grandchildren, Easton and Emma Wilkinson, Lincoln and Faith Billhardt. She was preceded in death by her husband, William A. Fries in 1985; grandchild, Myka Gray; her parents, Lawrence and Rose (Guy) Knouse; brothers, Norval Knouse, Russell Knouse and Kenneth Knouse. In lieu of flowers, donations in Alice’s memory may be made to Hospice of the Western Reserve, 300 East 185th Street, Cleveland, Ohio 44119 or to the American Cancer Society, 10501 Euclid Avenue, Cleveland, Ohio 44106.